Atil (Maerua crassifolia Forssk.) is a small evergreen tree, 3-10 m high, with a rounded flattish crown. Branches are twisted and often densely leaved. Leaves are oblong and ovate, variable in shape and size, usually 5-15 mm long and 2-8 mm broad, somewhat fleshy, glabrous and almost sessile. Flowers are white, sweet-scented and without petals. Fruits are pubescent, irregular cylindrical pods, 3-6 cm long, 0.6-1 cm broad, markedly constricted into 1-6 sections (eFloras, 2010; JSTOR, 2010). Maerua crassifolia is a multi-purpose tree used in fodder banks and agroforestry systems (Diatta et al., 2007). The wood is used to make tools and weapons. Leaves and fruits are edible for humans (Göhl, 1982). Crushed leaves and leaf decoctions are used in ethno-medicine to treat fever, stomach disorders and skin affections (Burkill, 1985). 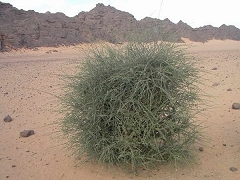 The Tuareg use the leaves to treat camels, either orally after crushing (against tick infestations or digestive disorders) or by local application against saddle wounds (Antoine-Moussiaux et al., 2007). The leaves can be cooked in butter or animal fat before application (Ag Arya, 1998). Infusions of leaves are also used for human intestinal diseases in North Africa, due to the health properties of their lipids and triterpenes (Ibraheim et al., 2008). Due to their high nutritional value, the leaves of Maerua crassifolia can be used in human diets during times of food scarcity (Freiberger et al., 1998), but only after boiling to increase palatability and remove factors such as saponins that cause diarrhea (Cook et al., 1998). Like other Capparidaceae, Maerua crassifolia is a good browse species, particularly in tropical Africa (Le Houérou, 1980b). It is hardy and tolerant to grazing (Le Houérou, 1980a) but remains stunted under heavy grazing conditions (Boudet et al., 1980). 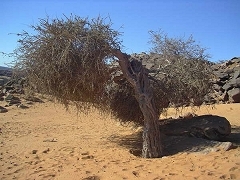 In very arid lands (Arabian Peninsula), trees are left half-dead after grazing (Chaudhary et al., 2006). Maerua crassifolia is native to soudano-sahelian and soudanese dry savannahs and deserts, in Mauritania and Senegal and eastwards across the northern Sahel zones (Morocco, Algeria, Lybia, Egypt) to East Africa (Ethiopia, Somalia, Sudan, Kenya, Tanzania and Uganda) and to the Arabian Peninsula, western Asia, Egypt and Arabia (USDA, 2010; JSTOR, 2010; Arbonnier, 2004). 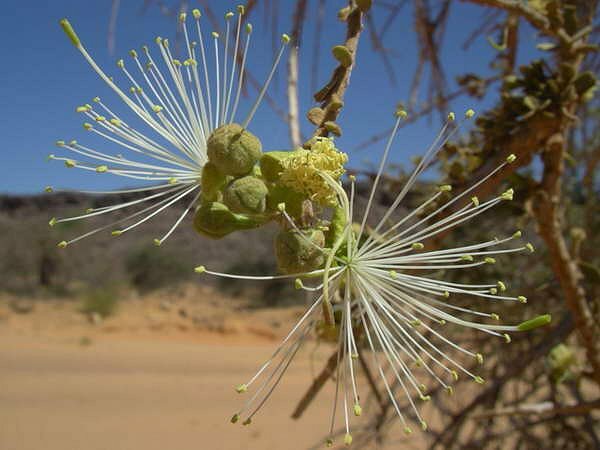 It grows in deciduous bush land, thickets and semi-desert scrub near rivers, from sea level up to an altitude of 1620 m in East Africa (CJB, 2010). Optimal growth conditions are 300-700 mm annual rainfall (Diatta et al., 2007) on poor sandy soils or clay soils (Göhl, 1982). It can tolerate much drier conditions, from 75 mm to 300 mm annual rainfall (Thompson, 1997). It is often found in association with Balanites aegyptiacus, another evergreen tree (Diatta et al., 2007). Maerua crassifolia leaves have a good nutritional profile, especially valuable in the dry season, due to their high protein content, low fibre and high digestibility (Calabro et al., 2007). They are rich in protein (15-25% DM) and particularly in some essential amino-acids such as phenylalanine and tyrosine (Cook et al., 1998; Freiberger et al., 1998). They are also rich in fat (7.3% DM), and minerals such as calcium (17-24 g/kg DM) and magnesium (6-7 g/kg DM) (Cook et al., 1998). 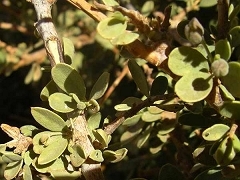 Maerua crassifolia foliage is a good forage rich in protein and macro minerals that can be fed successfully to camels and goats to supplement grasses during the dry season (Rahim, 2003). Maerua crassifolia foliage is highly palatable to most classes of stock (Boudet et al., 1980). Flowering shoots are relished by camels (Burkill, 1985). Grazed foliage was found to be palatable to goats in rainy and dry seasons and it was one of the most selected species in all seasons. Sheep showed a much lower preference for this species compared to goats (1 vs. 6% of selection) (Sanon et al., 2007). The low palatability of Maerua crassifolia leaves for sheep may be caused by high levels of tannins and a subsequent low level of rumen ammonia (Powell et al., 1990). Leaves of Maerua crassifolia have a high in vitro fermentation rate due to their low lignin content, high content of non-structural carbohydrates and probably low amounts of antinutritional factors, particularly when compared to other sahelian grasses and legumes (Calabro et al., 2007). However, incubated samples in rumen-fistulated camels and goats showed a low DM disappearance rate (Rahim, 2003). In vivo investigations of the feeding value of Maerua crassifolia feeding are very scarce. The true protein value and degradability of Maerua crassifolia leaves in different ruminant species need to be investigated further in order to determine their effectiveness to supplement nitrogen-deficient diets. Maerua crassifolia is palatable to horses but the flowering shoots are not browsed by them (Burkill, 1985).